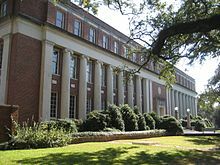 Tulane University is a private, nonsectarian research university located in New Orleans, Louisiana, United States. Originally founded as a public medical college in 1834, the school grew into a comprehensive university in 1847. The institution was eventually privatized under the endowments of Paul Tulane and Josephine Louise Newcomb in 1884. Tulane is a member of the Association of American Universities. The university was founded as the Medical College of Louisiana in 1834 partly as a response to the fears of smallpox, yellow fever and cholera in the United States. The university became only the second medical school in the South, and the 15th in the United States at the time. In 1847, the state legislature established the school as the University of Louisiana, a public university, and the law department was added to the university. Subsequently, in 1851, the university established its first academic department. The first president chosen for the new university was Francis Lister Hawks, an Episcopalian priest and prominent citizen of New Orleans at the time. The university was closed from 1861 to 1865 during the American Civil War. After reopening, it went through a period of financial challenges because of an extended agricultural depression in the South which affected the nation's economy. Paul Tulane, owner of a prospering dry goods and clothing business, donated extensive real estate within New Orleans for the support of education. This donation led to the establishment of a Tulane Educational Fund (TEF), whose board of administrators sought to support the University of Louisiana instead of establishing a new university. In response, through the influence of former confederate general Randall Lee Gibson, the Louisiana state legislature transferred control of the University of Louisiana to the administrators of the TEF in 1884. This act created the Tulane University of Louisiana. The university became privatized, and is one of only a few American universities to be converted from a state public institution to a private one. In 1884, William Preston Johnston became the first president of Tulane. He had formerly succeeded Robert E. Lee as president of Washington and Lee University after Lee's death. He had moved to Louisiana and become president of Louisiana State University. In 1885, the university established its graduate division, later becoming the Graduate School. One year later, gifts from Josephine Louise Newcomb totaling over $3.6 million, led to the establishment of the H. Sophie Newcomb Memorial College within Tulane University. Newcomb was the first coordinate college for women in the United States and became a model for such institutions as Pembroke College and Barnard College. 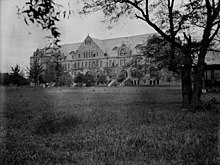 In 1894 the College of Technology formed, which would later become the School of Engineering. In the same year, the university moved to its present-day uptown campus on historic St. Charles Avenue, five miles by streetcar from downtown New Orleans. What are the academic rankings for Tulane University of Louisiana? 1. number 61 for Academics. 2. number 106 for ROI (Return on Investment). 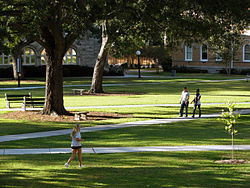 What universities are similar to Tulane University of Louisiana?